Born in Izmir in 1989, to a German mother and a Turkish father, Lena spent much of her life as a Turkish expat in a sense, moving to Germany when she was two and then to Brussels, Belgium when she was 10. By the time she finished high school she had spent summers in Turkey learning and honing her craft of windsurfing, which she first started in Alaçatı when she was 12 and 13. She spent her teenage years racking up titles in Turkey starting with local races and then winning Turkish championships. By the time she was 18 and with the assistance of her parents she opened her very own windsurf school in Bodrum's central Ortakent district aptly named the Lena Erdil Windsurf School. Since then she has gone on to win title after title in Turkey and internationally and at the ripe age of 27, she is currently the IFCA (International Funboard Class Association) World Champion and just last week came in second in the world's most prestigious windsurfing competition, the PWA World Tour, both for women's slalom. I had the chance to catch up with Lena on the heel of her PWA VICE WORLD Title to talk about her unprecedented success in the sport and her day job; which just happens to be owning her own windsurf school. First I asked her how many times she had won the Turkish Championship to which she said, "I don't even know how many times," when I pushed her further she came up with the actual figure; Lena Erdil has won the Turkish Championship a total of six times in her young career. Meanwhile, Lena also completed a double major in politics and philosophy at England's University of Sussex. She is also fluent in five languages, Turkish, German, English, French and Spanish and of course might I say quite strikingly beautiful with a contagious smile and laugh felt by all around her. After university she moved to Turkey when she was 24 and since then she has been at the helm of her windsurfing school in Ortakent which has since become her home. This year her career has seen unprecedented success. Back in May, Lena came in first in the world's most prestigious windsurfing competition the PWA (Professional Windsurfer's Association) World Tour that took place in Ulsan, South Korea giving her a great start to the season. Then in June, she took home the IFCA World Championship, an association recognized by the International Sailing Federation which holds a championship each year. This year's championship was held in Croatia and Lena's win was not only a career first but also the first time a Turkish athlete has ever claimed the title. In July, she became the Turkish Windsurf Women's Slalom Champion and in the final PWA World Tour held in Denmark's Hvide Sende September 4 to 9, she placed third, ranking her in the top second spot for the world championship, behind title-winner Aruba's Sarah-Quita Offringa. "We just finished the season unfortunately we only had two races this year normally the PWA compared to the IFCA usually has a world tour with races all over the world in different conditions and then you get the title. Every year, a championship is also held in Turkey, but that was cancelled due to what transpired in the country," she explained. "But in 2017 we already have a lot more stops confirmed. We will go to South Korea again and Japan is a new destination. There will also be New Caledonia, where races are held every two years," said Lena. I asked her what people think when they see this young Turkish girl achieving such great success to which she said, "Yes, I get a lot of nice feedback from people congratulating me and it's a really nice feeling, but now people have started getting used to it," she said laughing and adding, "I actually won my fourth PWA Trophy this year." Lena explains that overall the top three places get trophies so she has already won twice in third place and now twice in second place. Lena's first third place win at the PWA World Tour was in 2012, the same year she broke a record for Turkey by racing at 45.74 knots in the International Windsurf Speed Record competition held in Namibia, placing her in the top second spot in the world. In 2014, she placed second in the PWA World Tour and won the Slalom Indoor Championship title. In 2015, Lena placed third in the PWA once again. Meanwhile, year in and year out she has also garnered Turkish Championship titles and there really are too many to mention. She has also sponsored by all of the big hitters as a Red Bull athlete but also by Turkish Airlines, Oakley, Hurley and also her sports club Bodrum Sports. You can also watch her in action in the YouTube video "Winter Training Diaries." When I asked her if anyone in Turkey had ever won before, she said that, "In fact all of her results in the world cup PWA championships thus far have been firsts for Turkey, both the IFCA championship and coming in second in the PWA World Tour." But there are high hopes for Lena to take over the title next year to which she said, "So, I guess people are used to seeing me on the podium over the last five years and now they are expecting first place. I will do my best to win this title because this is the most prestigious title anyone can possibly win in windsurfing." 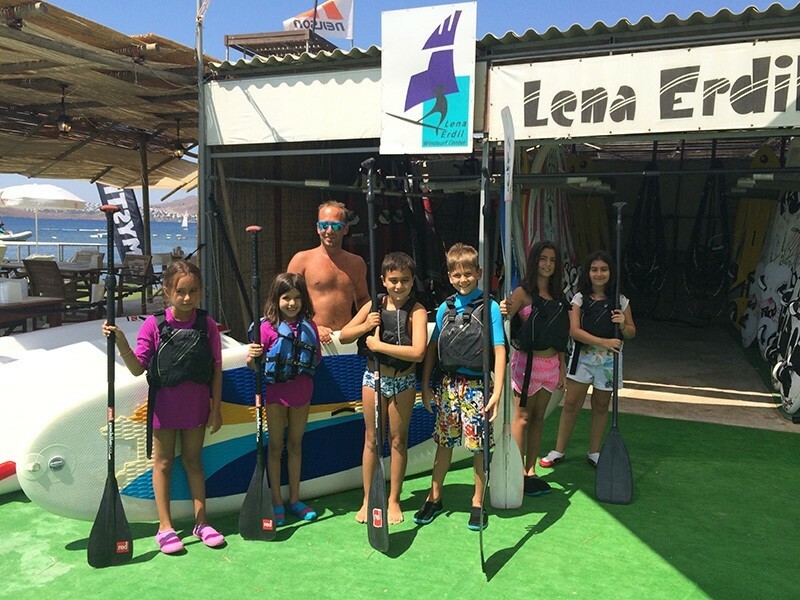 In the meanwhile, you can catch Lena Erdil at her windsurf school in Ortakent, which she opened with her parents and is now going into their ninth season. Open 12 months of the year, Lena only teaches private advanced lessons, "no beginners and not every day," she said adding that the school has a lot of qualified windsurfing instructors who teach all levels and even in English if necessary. Although she practices in Cape Town in the winters, I asked Lena where her favorite place to windsurf is and she said, "Of course Bodrum is my home town and my home base is in Ortakent. I love it here, it is a really special place and it is windy almost every day. I don't think many people know about it in Turkey or in the world, but there aren't many places that are quite so windy so often. "